Ocean dredged material disposal sites (ODMDSs) E, F, and H are located off Coos Bay in southwestern Oregon. The 19-square-mile bay is formed by the junction of Isthmus Slough, Coos River, South Slough, Kentuck Slough, Haynes Slough, and Winchester Creek. An update to the 2006 SMMP was needed to provide safe and efficient disposal of dredged material at each of the Coos Bay ODMDSs while minimizing the effects to coastal resources. The primary goal of site management and monitoring is to ensure that the use of the sites complies with MPRSA requirements and that the ODMDSs are managed properly. Appropriate management of an ODMDS is necessary to ensure that disposal activities will not unreasonably degrade or endanger human health, welfare, the marine environment, or economic potentialities (MPRSA 103 (a)). Specific management objectives include (1) avoiding the creation of persistent mounds, (2) practice beneficial use when possible, (3) minimize negative effects on marine resources, (4) minimize interference with other uses of the ocean, (5) maintain safe navigation and commerce, (6) promote safe and efficient dredge operations, and (7) document disposal and monitoring activities. An annual average of 1.2 million cubic yards of dredged material is disposed of at the three sites. 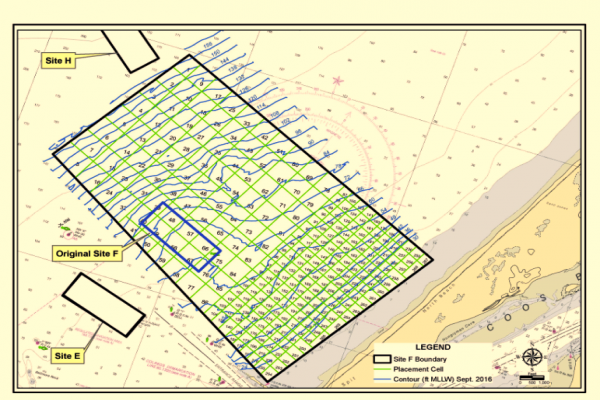 ANAMAR was contracted by USACE Portland District to generate an updated SMMP for Sites E, F, and H. The SMMP provides up-to-date information on site characteristics, management objectives, disposal history, dredged material characteristics, timing and techniques of disposal, results of site monitoring surveys, a future monitoring and special studies schedule, and special management conditions for these sites.